This fall at Mannes College of Music in New York a new ensemble has sprung up, creating quite the controversy: the iOrchestra. Dean Richard Kessler, whose vision for Mannes mandated the creation of the iOrchestra. What is hiding behind this cool name? According to its creator Todd Reynolds, the ensemble’s name is totally deceptive: no robots or lasers or intergalactic connections of any kind on the program. The idea behind the orchestra is to have students understand technology and start having their own thoughts about what they want to accomplish with it musically speaking. 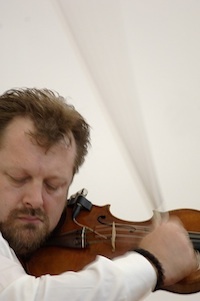 Reynolds is a violinist and new musician who played with Steve Reich. He was also a student of Heifetz and an orchestra player. For him technology is as normal as a violin: “if I had stuff stolen out of my car I am not sure which one would be more important, the violin or the laptop”, he says. Everybody who uses a computer, plays an instrument, hears music and speaks the musical language is welcome to be part of the iOrchestra, after completing an introductory course called “Go Digital”. “I personally believe that every person has the potential to be a performer, an improviser, and a composer, and an electronic musician, and the iOrchestra is our attempt to synthesize it all.” This new project will culminate at the end of the year with a concert. Students will present works they have written and works from composers, along with improvisations borne out of the environments they create, including soundsculpting, looping and file playback. They will perform together or in small chamber groups using both acoustic and electronic instruments augmented with software, creating a sort of hybrid instrument, and a hybrid ensemble. “Over the next few years, the iOrchestra is going to become a sort of container for teaching all of that new music, classical music, technologies, improvisation all at once on a basic level”, specifies Reynolds. “So that students can then become inspired by it and take it with their own excellence to the next level.” Hopefully, after years of existence, a number of different classes and a couple of different levels of the iOrchestra will be available. Surprisingly, Reynolds says that one of his models for this new project is Johan Sebastian Bach. Was he not a composer, an improviser, a performer…and an electronic musician? “He was the first electronic musician”, says Reynolds. “Granted there was no electricity but seen through a more universal prism, the organ is closely related to MIDI instruments of today. One can says he used the technology available to him in the same ways that we do today.” If you look around you today, things have changed. Todd Reynolds, and the Dean of Mannes, Richard Kessler who brought him to the school, believes that our education policies have to change as well in order to equip students to have a foot in both worlds: history that we study to get better, and the current practices that we are surrounded by. Truth is that everything – science, politics, technology, etc – moves forward and there is no way to stop things from moving. “You can’t stop graphic design because you want to preserve painting”, points out Reynolds. “You cannot ask somebody to stifle their musical expression because there must be Beethoven.” Everything coexists; nothing will be diminished by anything. There will always be Beethoven, there will always be Van Gogh, there will always be all of those great traditional artists we revere and study from. Classical music exists inside of tradition to be sure, but if it’s stiffly by one mode of thinking or a single approach, there is no room for the actual art form to live and expand. It is not surprising at all that some people think that conservatories who go this route will lose their Beethoven, will lose their Bach, will lose their tradition. “But nobody’s going to let that happen”, assures Reynolds. “I will never ever in my life teach new music without teaching old music right alongside of it, or pop music without teaching classical music right alongside of it because one doesn’t exist without the other. It’s a trajectory, an arc, a spectrum where all can be seen as impacting the other.” For him, improvisation, jazz and all the other styles of music make classical music more relevant rather than less relevant. Studying other “musics” would provide a deeper connection and a deeper relationship to the music we have been teaching, writing and performing forever. This new direction, which is personified in the iOrchestra is about exploring and finding your own way through music in the way that things are today, from the spirit of how things are now. I want my students to look at their instrument as the possibility of being hybrid: acoustic instrument and technology. And hopefully if I do my job right, if we all do our jobs right, people come out of school being super well rounded”, concludes Reynolds. And that is what this whole move at Mannes is about: being a musician at its fullest. Mannes is a new key, a new way, a new school.